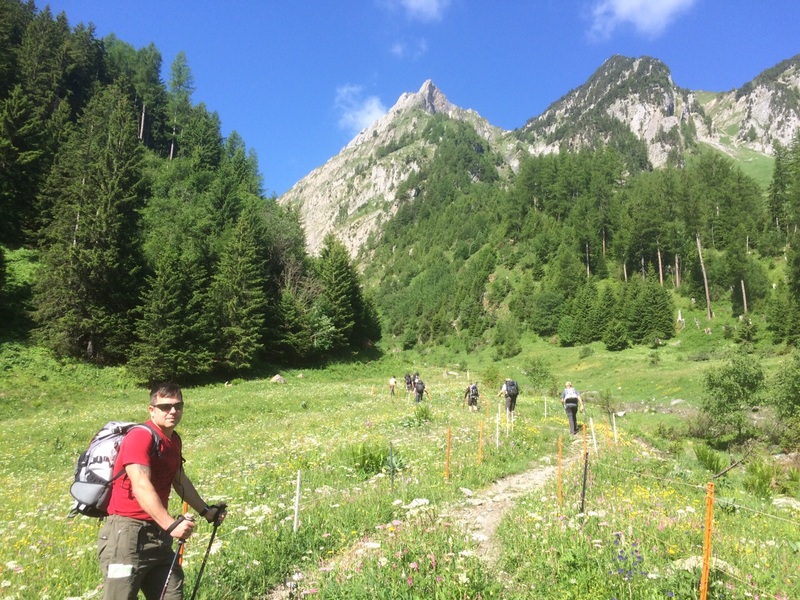 A “Very Polite” Walk in the Alps – Reservists on the Tour du Mont Blanc. After arriving, setting up the first campsite it was time for a quick introductory brief and a final kit check before departing for the first stage of the trek. Refugio Elena to La Fouly via Grand Col Ferret. The first stage started a few kilometres away from Refugio Elena, a gentle incline took us to the hut itself and from this point the real work started. 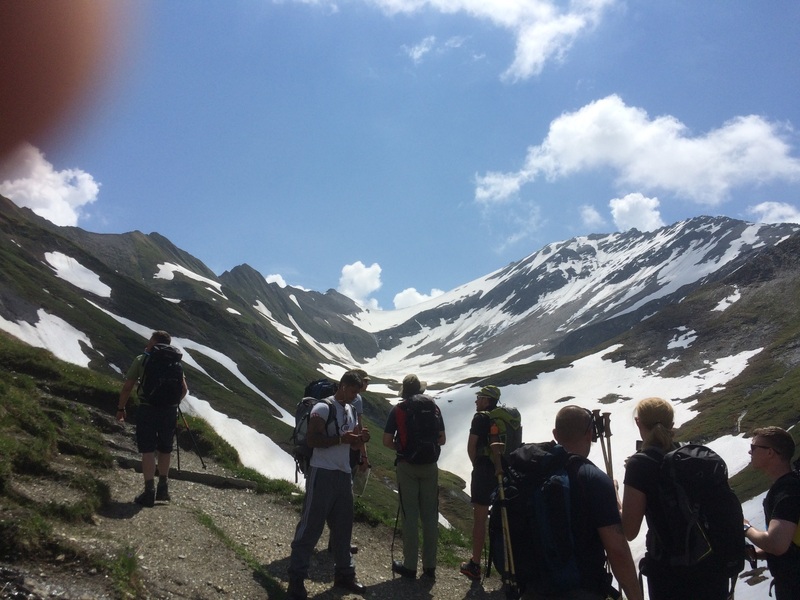 With 895m of ascent over approximately 4km of tight switchback paths this first day really threw the group in at the deep end although fatigue was yet to set in. At 2537m the background depicted a vast difference from the scenery seen on the ascent. The immediate terrain now also altered with permanent snowfields governing the first kilometre of the descent into La Fouly. The second stage promised to be more forgiving. Following the valley alongside the river from La Fouly as we carried on the path was blocked by young bulls fighting for dominance, clashing with heads lowered and horns occasionally getting too close for comfort to some of the group. Needless to say the pace slowed significantly while we gingerly picked our way between the fighting bulls eventually emerging into some more inhabited areas of the valley. As we ascended in to Champex we arrived at the lake in giving us time to soak our feet before establishing the campsite. Champex to Col de la Forclaz via Alp Bovine. Stage three saw the group tackling steep ascent immediately from the get go, moving steadily through heavily forested switchback paths it wasn’t long before the entire group was drenched in sweat. Humidity rose rapidly in within the tree line and coupled with the 32° temperatures we were all glad to break the treeline and be greeted with the fantastic vistas on the Alp Bovine route from around 2050m. It was a very steep descent, requiring great care to finish the day. Col de la Forclaz to Tré-le-Champ via Col de Balme. (Switzerland, France, 13km, 1069m ascent). The final stage was to be the most challenging but also promising the most spectacular views of the week. With another start deep in the tree line everyone was keen to escape the humidity again and the pace was quick until we emerged. From there the pace slowed dramatically as we strung out across the shoulder of the valley climbing towards the Refuge du Col de Balme but the hard work was worth it as we crested the final ridge and stared down the valley towards Chamonix, a picturesque panorama of the Alps surrounding us. 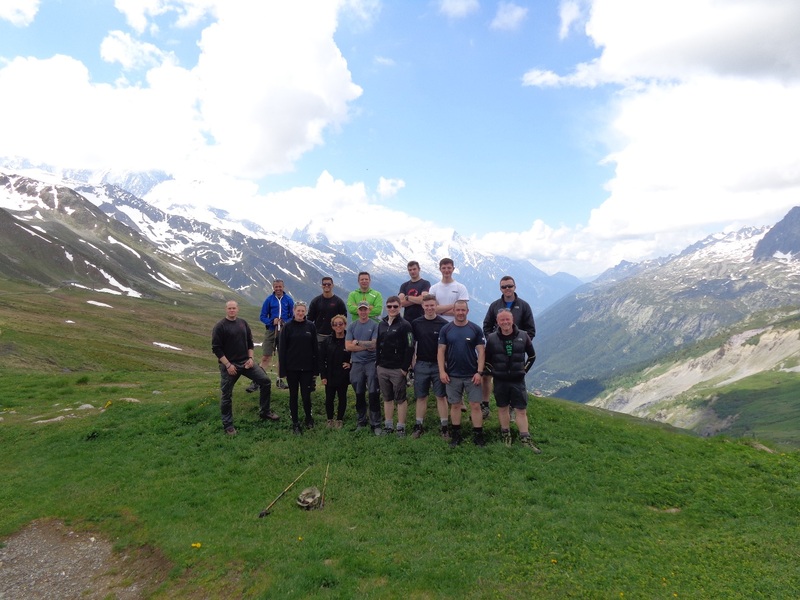 A quick group photo on the Swiss/French boarder and then we began the descent towards Tré-le-Champ arriving tired and very sore from the steep switchbacks. 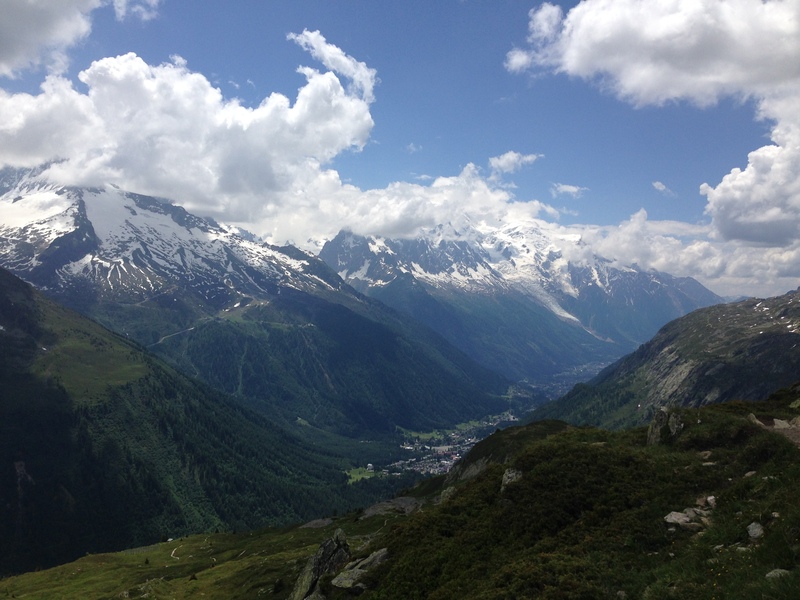 The final day of the exercise went on the Aiguille du Midi cable car in Chamonix town centre, where we traveled to 3842m; this represented the highest altitude reached on the exercise with some of the group really feeling the effects. We spent a few hours taking in the views, touring the museum and having a quick brew. In the evening the entire group moved to Jekyll and Hyde’s, an extremely popular restaurant and bar in Chamonix for a final meal as a group. With the excitement over and only the 24 hour journey home to look forward to it was time to reflect on the week. Without the hard work of SSgt Benson, PSI Cbt 202 Fd Sqn in organising the trip and financial support from 8 Engineer Brigade, 42 Headquarters North West and Infantry Brigade and the Ulysses Trust the whole expedition wouldn’t have occurred. 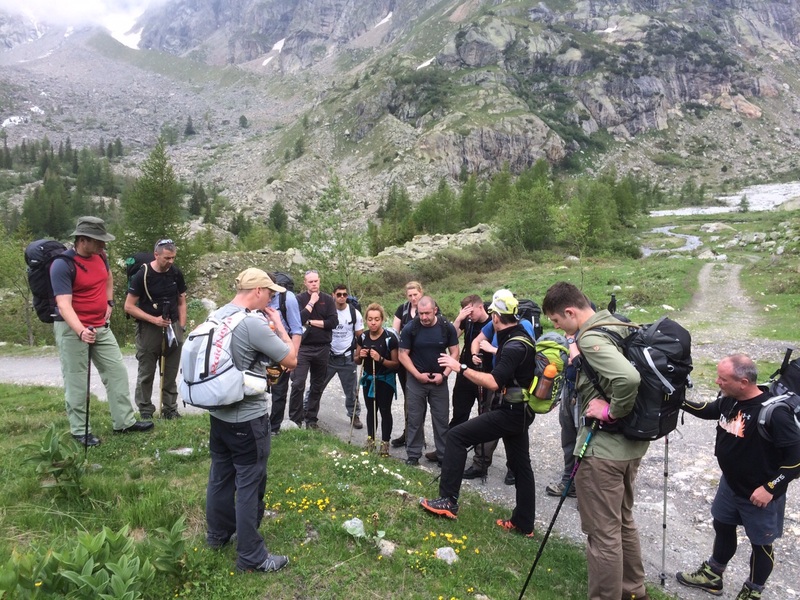 A huge thanks must also go to WO2 Keith Jenns RAPTC for his insightful lessons and passion for the mountains which added an extra dimension to the whole week for all. All in all, a very successful, “very polite” and enjoyable week trekking the Alps, getting everybody back in one piece with a smile on their faces just made it even better.